Pepperoni Pizza Rolls-these easy pizza rolls are made with pizza dough and stuffed with pepperoni and mozzarella cheese. They also get brushed with garlic butter and sprinkled with Parmesan cheese. 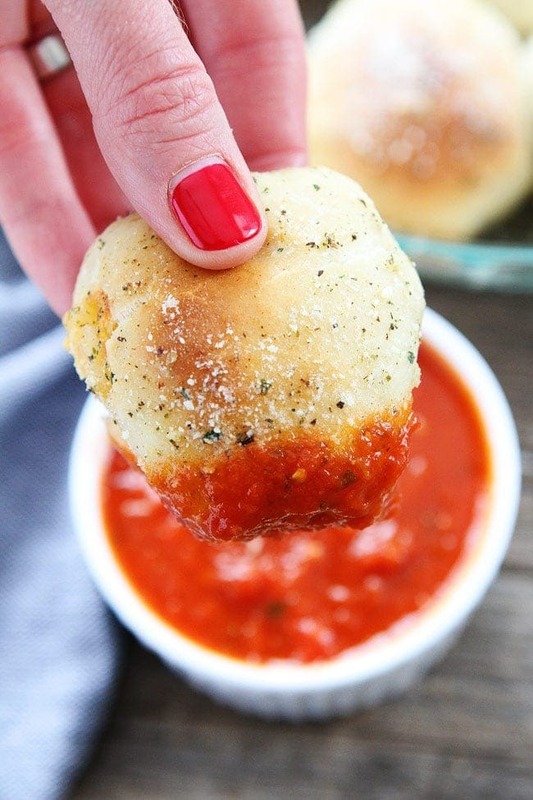 Dip the rolls in pizza sauce or marinara sauce! Mmmmm! My boys are very excited for Super Bowl Sunday! They love football! Maxwell already yells “Touchdown!” and Caleb has a good arm on him! They also love football food. They requested Pepperoni Pizza Rolls for the big game! We made these Pepperoni Pizza Rolls during the playoffs and they didn’t last long. My boys gobbled them up! 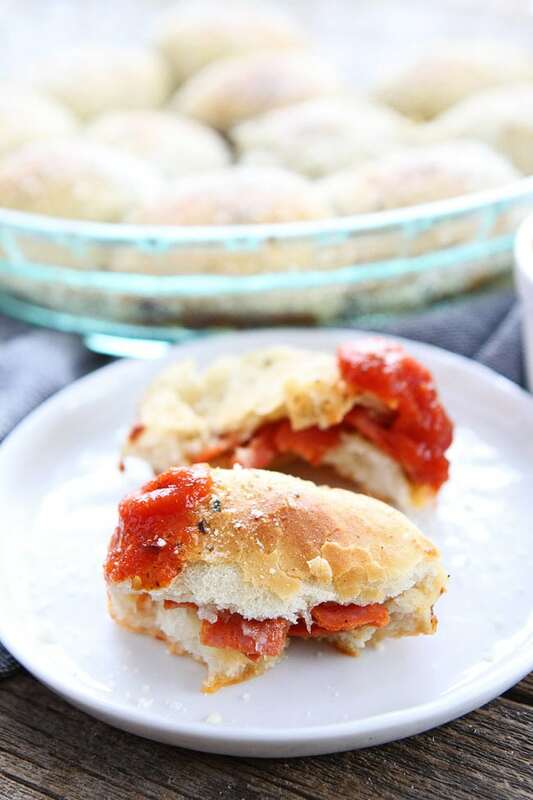 The rolls are easy to make and are a mix of pepperoni pizza and our favorite garlic knots. The best of both worlds! 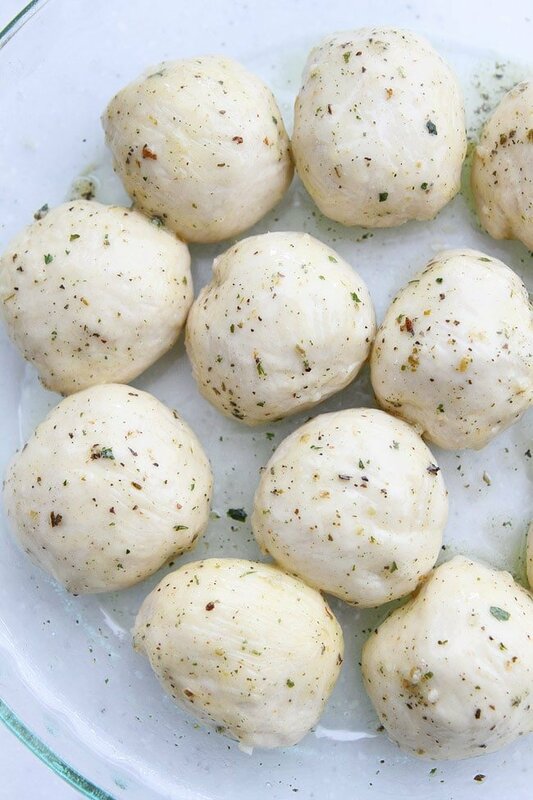 To make the rolls, use your favorite pizza dough. You can make the dough from scratch or you can cheat and buy it from the store! 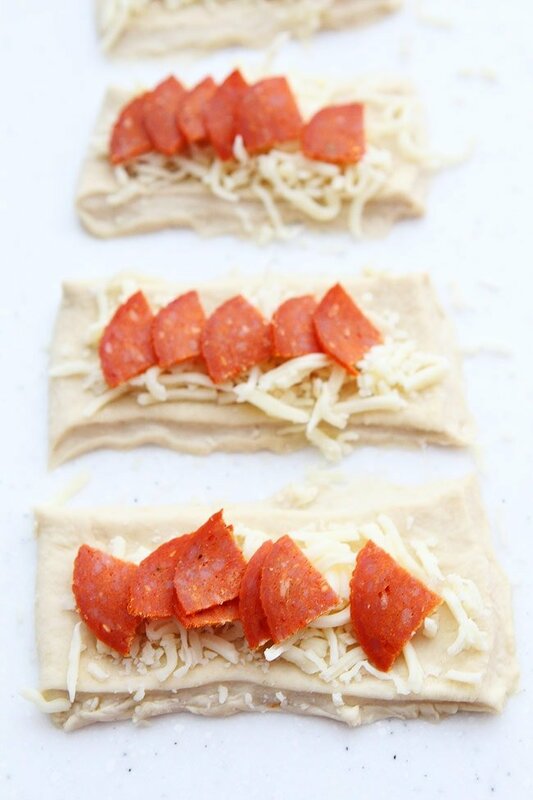 Roll out the dough, cut it into rectangles, and top each rectangle with shredded mozzarella cheese and pepperoni. Carefully take the ends of the rectangles and roll them up around the toppings, pinching the ends to make a ball. Place the balls in a pie pan and brush with garlic butter. Bake until golden brown and add more garlic butter and lots of Parmesan cheese. Serve with pizza sauce or marinara sauce. The boys love dunking the rolls! They are fun to make and fun to eat! Get excited for game day and make Pepperoni Pizza Rolls! They will probably be the best part of the game:) Enjoy! 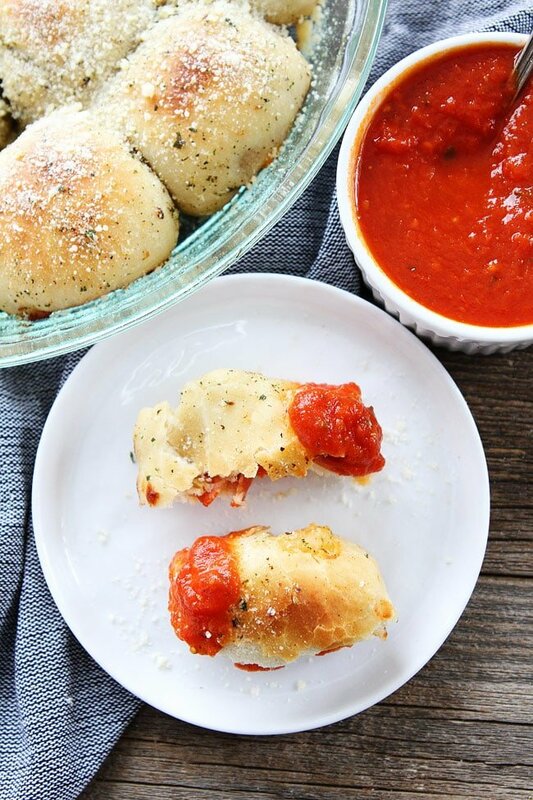 These easy pizza rolls are filled with pepperoni and cheese! 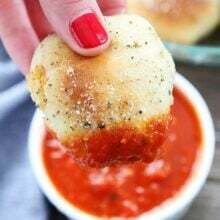 Dip in pizza sauce or marinara sauce! Kids and adults love them! 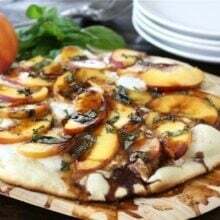 Preheat oven to 400 degrees F. Grease a 9-inch round pie pan with cooking spray and set aside. 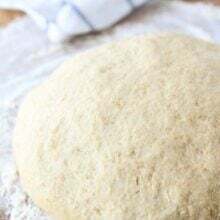 On a lightly floured surface, roll the pizza dough out into a large rectangle. Use a pizza cutter or sharp knife to cut the pizza dough into 12 equal rectangles. 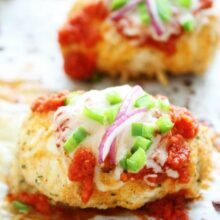 Place about 2 teaspoons of shredded mozzarella cheese on each rectangle. Top with pepperoni pieces. Carefully take the ends of the rectangles and roll them up around the toppings, pinching the ends to make a ball. Place the balls in the prepared pie pan. In a small saucepan, melt the butter and cook the garlic for 1-2 minutes over medium-low heat. Remove from heat and stir in dried basil, oregano, parsley, and a pinch of salt. Brush the pizza rolls with the garlic butter, reserving half of the mixture for later. Bake for 20 minutes or until the tops are golden. Remove pan from oven and brush with more garlic butter. 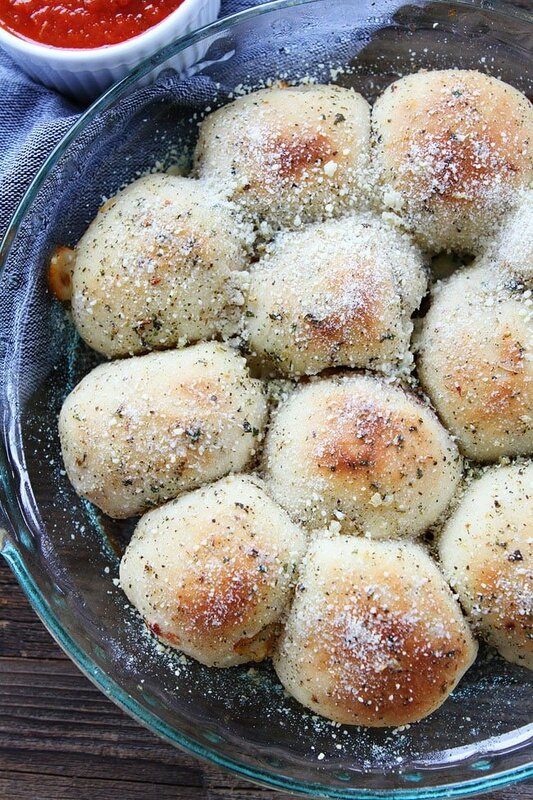 Sprinkle rolls with Parmesan cheese. 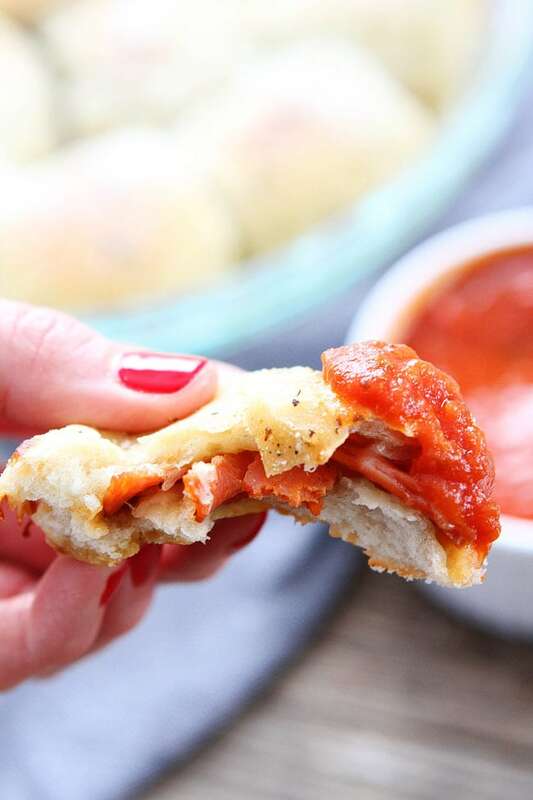 Serve the pizza rolls warm with pizza sauce or marinara sauce. Okay I can so see these on tables everywhere for Superbowl parties! Such a fun finger food and these just look top notch! Top of the list for Superbowl eats and treats! Delish! And simple to make. When when tried to order a pizza in Buffalo on Superbowl Sunday last year, they told us the wait would be 4 hours!!!!!! It’s like, oh, I’ll be sleeping then. In bed by 9 p.m. (big dork here). Making these instead! These rolls look amazing!! Pinned and making for the Super Bowl! It’s snacks like these pizza rolls that make me look forward to the big game every year. I’m usually more entertained with the food than with the game..
Im pretty sure the whole pan wouldn’t even be enough for me…they look sooooo good! 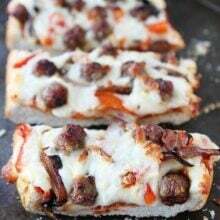 I’ve been planning my super bowl menu and THESE are going to the top of it!! LOVE! I’m sure these are absolutely delicious! Such a fun game day recipe!!! These look amazing! I can’t imagine game day without these rolls! Made these for dinner and they were great. My family loved them. They also tasted great the next day for lunch. Thanks the recipe. These look absolutely delicious! Being in the UK i won’t be making them for the Superbowl but i know my boyfriend will like them no matter the reason behind them being made! For anyone that has made these, about what size do you roll the pizza dough and how wide are the individual strips? I made these and they are great. However, I had a hard time getting 12 strips from my pizza dough. I may have made the strips too long because I had a difficult rolling these into a ball shape. Delicious though and I would make again, but just wanted some clarification. Thanks! Made these for a football party today and they were a huge hit. I did pretty much the same, but I put a little bit of homemade pesto on the inside of the dough before putting the cheese on. Just gave it a little more garlicky/herby flavor. Great recipe, which I’ve already been asked to make again. Made these tonight and they were voted “dangerously delicious” made the cut for our Italian Christmas menu. I did not add the oregano, basil, or parsley just personal preference. I did cook the garlic a little longer than called for and I felt that added to the depth of flavor. Thank you for the wonderful recipe! I am wondering if these can be made ahead of time, place in pan, covered, refrigerated, and then baked later. Do these freeze well for lunches?